Learn how to make this fun and contemporary bracelet that features a micro-macramé knotted and an embellished "Fiber Bead". 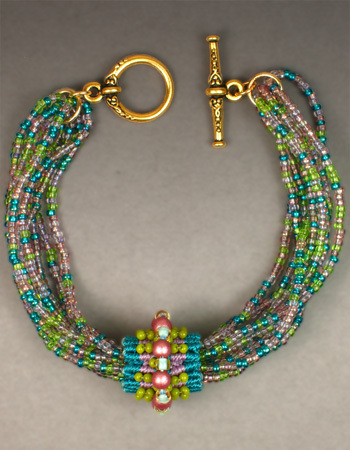 The Fiber Bead is the centerpiece of an multi-strand beaded bracelet that is quick and easy to put together. Kits are available in several colors for this project. Techniques - Micro-Macramé (Mounting Knot, Dbl. Half Hitch), Bead Embroidery, Bead Stringing. 4 videos, total class time = 25.14 minutes. If you already paid to take this class, you can log in to Fiber Bead Bracelet here.